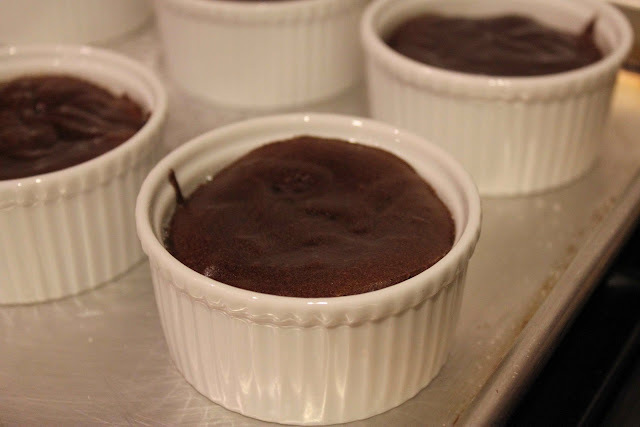 These Hot Chocolate Cakes, also known as Molten Lava Cakes, not only look fancy, but they taste like you have just eaten at an expensive 5-star restaurant. They are extremely easy to make, and pretty quick to make, start to finish, as well! The recipe come from one of my favorite places on the earth…you guessed it…Neiman Marcus! I strongly recommend that you buy “The Neiman Marcus Cookbook” by Kevin Garvin; it is wonderful! 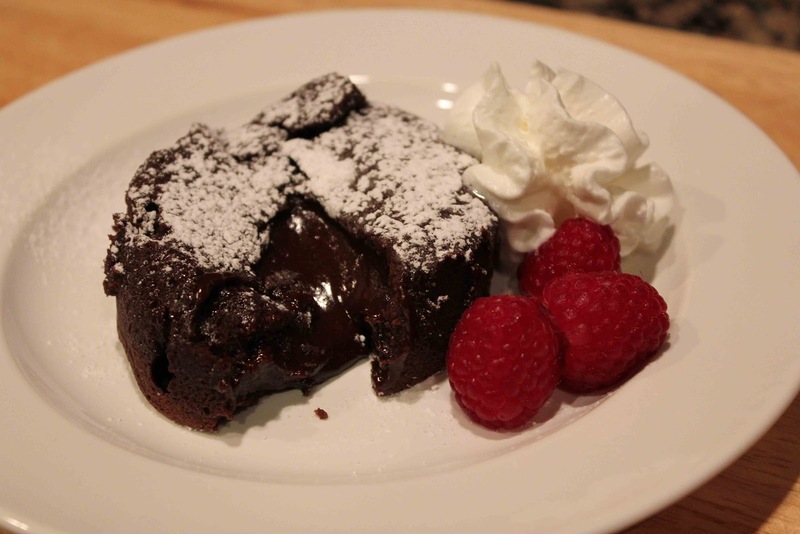 I made these Hot Chocolate Cakes this past weekend for my husband and two friends and they were a hit! The boys loved them and were in awe with how the inside was like pudding and the outside was like a brownie. When you cut into these cakes, expect to be amazed when “chocolate lava”, or chocolate pudding consistency, pours out of the chocolate cake. When you make these, allow the cakes to “set up” just a little before you invert them on plates…otherwise, you’ll have a runny, pudding mess! The set up time allows for the cakes to maintain its brownie-like exterior, and pudding-like interior. Sprinkle them with powdered sugar and top with fresh raspberries. A scoop of vanilla ice cream melts wonderfully with the hot chocolate cakes! If you happen to have leftovers, refrigerate the cakes, and the next day they taste just like fudge! I probably gained 5 pounds this weekend just on molten lava cakes! They are so delicious! Enjoy! 2. Melt butter and chocolate and add Amaretto. Remove from double boiler and add eggs and egg yokes. Using a wire whisk, temper the yolks and chocolate while whisking to combine; the mixture will be very thick. 3. 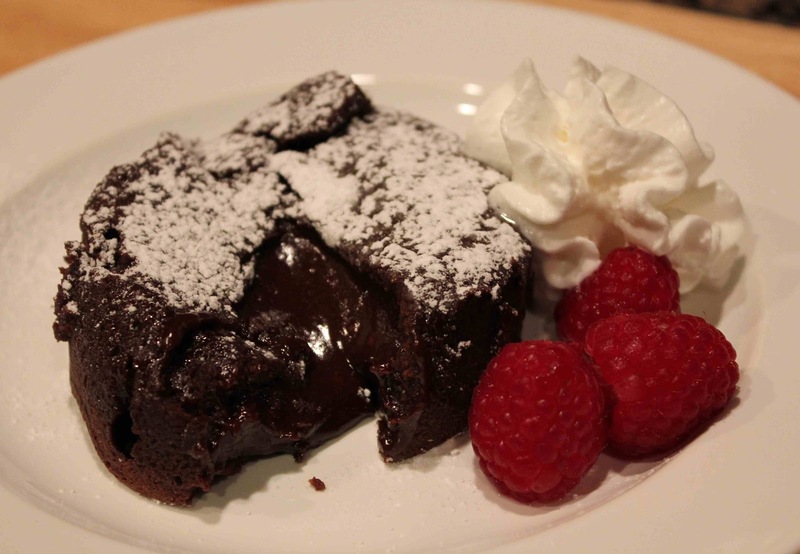 In a large bowl, sift together flour and confectioner’s sugar and then stir into chocolate mixture. 4. Spoon about 1/2 cup of mixture into each of the 8 buttered and sugar-sprinkled dessert molds with a diameter of 2 1/2 inches. Place molds on cookie sheet in oven. 5. Bake for 8-10 minutes (mine took about 10-15 minutes), until cakes are set on the outside. They will look like finished brownies on the outside, and will be soft like pudding in the inside. 6. 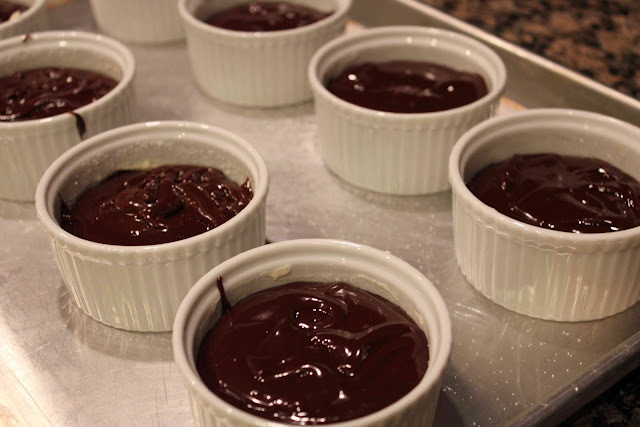 Remove the cakes from the molds and serve immediately.